Some people have difficulty keeping friendships going. People will lose touch or just fall out of favor with one another. These are 12 secrets to make your friendship last for a lifetime. A friendship cannot be one-sided. It requires both parties to show dedication and appreciation for one another. You and your friend should support each other through words and through actions. Let them know how much you care about them on a regular basis and show them by supporting their hobbies and aspirations. You’re not going to see eye-to-eye on everything with your friends. If you do, that would make for a rather boring relationship. When disagreements do come up, don’t let them ruin your bond. Instead, you should discuss how each of your viewpoints came about and focus on what you do agree on. A relationship cannot be expected to blossom if you aren’t spending time with one another. You don’t need to be around your friend all the time, but you should certainly be around them enough to feel as though you are growing with them. A strong bond is forged on trust. If you have a close relationship with a friend, you should be able to talk about anything with them. This doesn’t mean you should be spilling out your social security number, but you should definitely be willing to talk with them about things that have been bothering you. Research suggests that understanding what bothers a friend can create more harmony in your relationship. No, you don’t need to create an entirely new way of speaking. However, a close relationship with a friend is one that lets you communicate in ways you couldn’t with most other people. You might have inside jokes or catchphrases that you throw around. It can make your relationship much richer. You might take your relationship for granted after a while, but that doesn’t mean you should stop noticing things about your friend. For instance, if they get a haircut, you should totally compliment them on it. Your support means a lot to them. Friends are people who are there for you in times of need. This can range from simple things like helping you move to being a shoulder to cry on when you’re feeling low. You don’t have to wait for them to ask you either. Just ask if there’s anything they need help with. Going to classes and trying new foods is fun enough when you’re alone. However, it’s even more fun when you have a friend by your side. The two of you can enjoy reminiscing about the experience and telling others about it. Whenever you see fit, you should do something very generous for your friend. It could be buying them tickets to a show they’ve wanted to see. It could be throwing a surprise party for their birthday. Whatever it is, they should feel warm feelings and satisfaction about being your friend. A strong relationship is forged on strong communication. You should be doing your best to have eye-opening conversations with your friend. Talk about things you’re reading, things going on at work, or whatever else crosses your mind. When they bring up a topic, engage them as much as possible, even if it’s something that doesn’t necessarily interest you. Just because a friend moves away, it doesn’t mean the relationship has to end. Yes, it might be changing, but changes aren’t necessarily bad. You want to keep in touch in a meaningful way. You should text and email them or even talk on the phone and write letters. When you get a chance to see one another, take advantage of it. You want your relationship to withstand the boundaries of city lines. 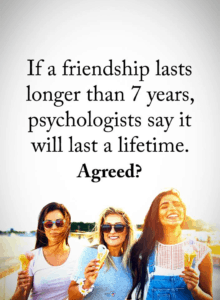 A long-term friendship cannot be forced. It requires selflessness and understanding in order to work. If you want to make the most of your friendship, you need to be willing to be vulnerable and supportive. By using these tips, you should be able to do that.